Players take on the roles of a team of amateur thieves hired to obtain a work of art. All players work together to identify which piece of art they’re after and plan how to steal it while balancing the team’s humorous assortment of skills & hangups. In about an hour and a half, the team will case the joint, plan their caper & try to convince each other that this will work. And if the group can tolerate each other long enough to complete their scheme, it just might! 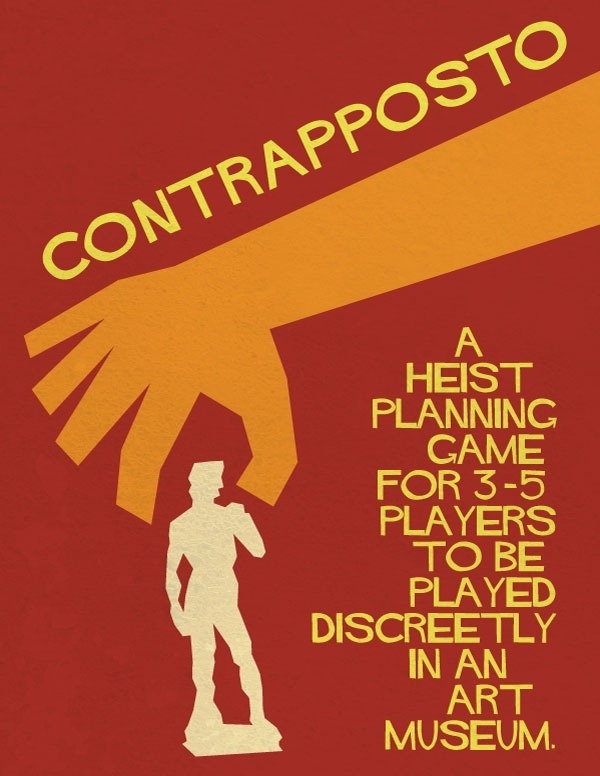 Contrapposto is part improv comedy and part exercise in teamwork, with a healthy respect for art & museums thrown in. Don’t worry: no actual laws will be broken while playing! It is a fun way to visit an art museum with a group of new friends. REGISTRATION:If you are interested in playing, fill out our Contrapposto Sign Up before 11:59 pm on Friday, November 18th. You should know if you are in or out of the larp by Monday, November 21st. Registration will be open after the deadline for stragglers, but a place will not be guaranteed. No costumes required, thieves must blend in! There is nearby public transit from buses 2, 5, 9, 11, 17, 18. ACCESSIBILITY:The play venue is a publicly accessible building and free of charge to enter. Climate controlled space, plenty of seating available.